Charlotte and Harry Spizman were regulars at Marie Callender’s. Two, sometimes three times a week – and always on Sunday — they’d show up at the restaurant’s sole Seattle location where they’d treat themselves to the salad bar, soup and cornbread included. The couple regularly spent about $200 a month on soup, salad and (on the rare occasion when Mr. Spizman would go for the gusto) Marie’s mac ‘n cheese maybe, or a roast beef dinner. Then came last Sunday’s abrupt closure, when customers and staff alike were shown the door, just as the Spizmans were coming in. 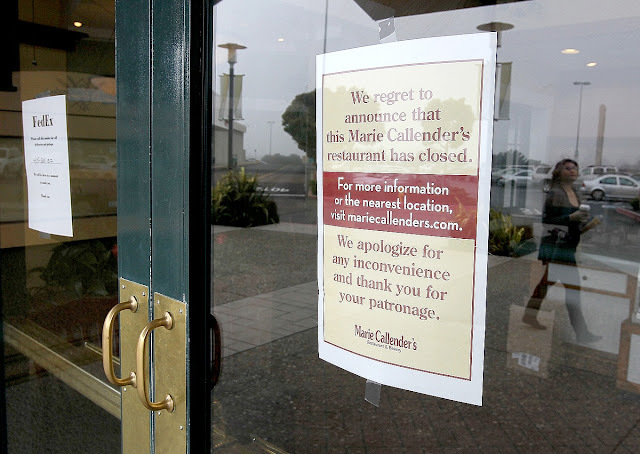 Corporate owners of the chain restaurant have filed for bankruptcy: a blow to the to the many loyal patrons who considered Marie Callender’s their home-away-from-home. “The staff were like family to each other,” said Mrs. Spizman, recalling her favorite servers, Rhea, Isobel and Danielle, who knew what kind of soup (chicken) and beverage (Diet Pepsi) she and her husband always ordered, and without having to ask served those promptly with a smile. The Spizmans recognized other regular patrons and sometimes chatted with them, too, including one man who ate there every day. Good question, and I’m going to turn it over to you, dear Eaters. When it comes to affordable family-friendly, senior-citizen-loving restaurants, what’s left? Brownie points (or is that pie points?) for places offering a salad bar for the Spizmans.